Explore Misty May and Kerri Walsh quotes. Find interesting facts about Misty and Kerri. “I’m in!” – Kerri right after the second Olympic Gold medal in Beijing when interviewer hinting at expanding their family. “I know that she’s trying, and that’s all I can say!” Kerri about her partners Misty May’s plans about pregnancy and having family. Misty attended Newport Harbor High School in Costa Mesa, California. Attended California State University, Long Beach. Won a national championship with Long Beach State in 1998. Married to baseball player, Florida Marlins catcher Matt Treanor in 2004. She works as an assistant women's volleyball coach at Irvine Valley Junior College. Misty has two dogs - boxers, Gruden and Boogie. 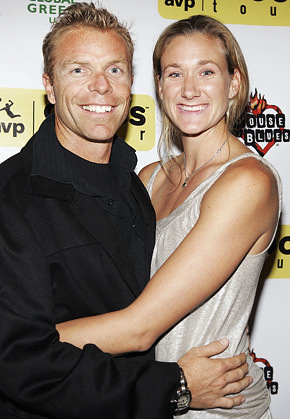 Kerri Walsh and her husband. Graduated from Archbishop Mitty High School (San Jose, Calif.) in 1996. Graduated from Stanford University with a BA in American Studies in 2001. 1996 and 1997 – won a national championship with Stanford University. Married Casey Jennings in 2005. Jennings is one of the top men's volleyball players on the AVP Tour. Kerri asked Misty May for her autograph, when Kerri was a sophomore in high school.